Ok, this red curry squash chicken bowl is hands down my fall favorite. It only takes 25 minutes to prep and cook, and it is so delicious. It tastes cozy and comforting, all wrapped up in fall flavors. I never realized how robust red curry is. 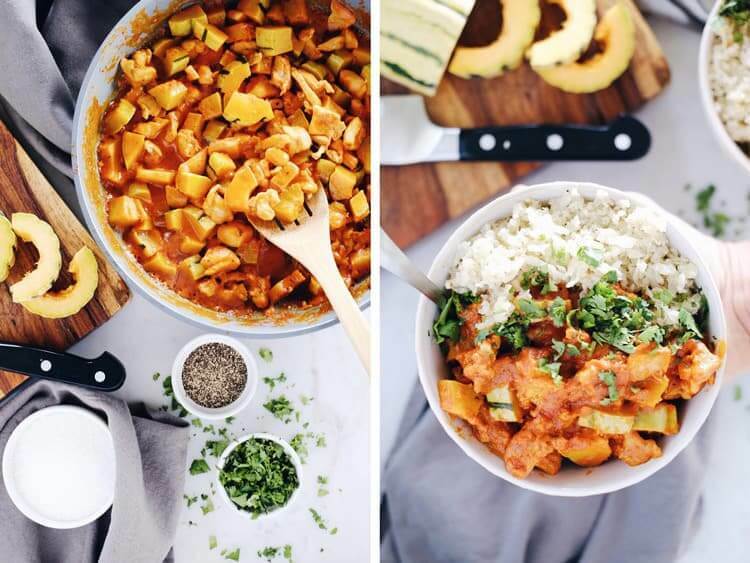 I just love how the curry is cut by the lightly sweet squash. Put it all over some cauliflower rice in a bowl, and I’m sold! I think you will be, too! 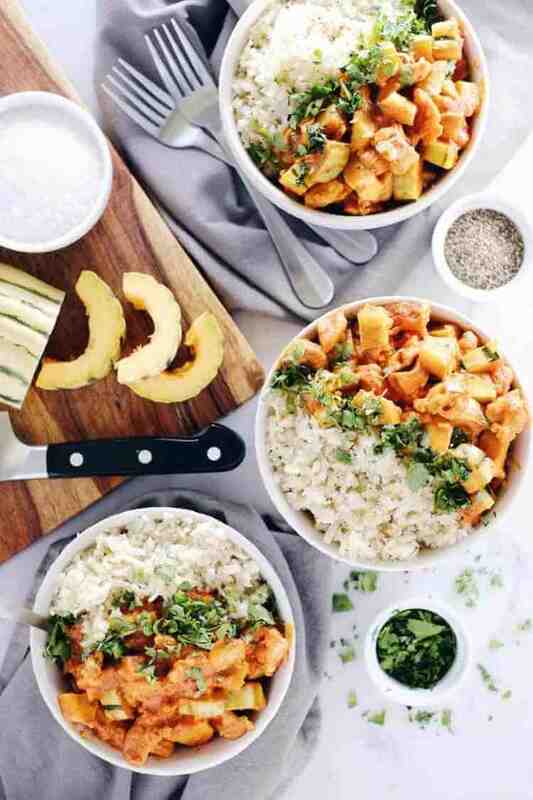 If you are looking for a simple and quick recipe, this red curry squash chicken bowl is definitely the dish for you! Plus, the leftovers are almost even better than the day you prepared it. When you have a busy day, it is nice to be able to throw this together in less than a half hour. The flavors are rich, yet balanced, with the tiny bit of spice from the red curry paste, and the slightly sweet delicata squash. Paired with cauliflower rice that gets a little crispy cooked on the stove, this is an all around winner. Chicken is the perfect protein for this dish! It is mild and goes great with the squash and curry flavors. If you are unfamiliar with curry pastes and powders, look for something with clean ingredients you can pronounce and no added sugar. You can find a clean red curry paste at a health food or ethnic food store. We use Thai Kitchen red curry paste we purchase at Whole Foods. 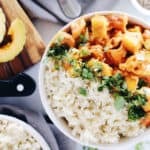 We know you have a busy week, so make your life a little easier and plan this red curry squash chicken bowl for dinner. Then, let us know how it goes by leaving a comment below, and take a photo to tag us in on Instagram @realsimplegood, so we can check it out! Cut up chicken and season with salt and pepper. Cut up delicata squash and garlic. Rice cauliflower in a food processor with a grating attachment or with a hand grater. In a large skillet over medium high heat, add 1 tbsp coconut oil. Once the oil is hot add in chicken to cook, stirring occasionally, until the outside of of the chicken is white, about 5 minutes. Add the delicata squash, curry paste, tomato paste, and garlic and stir for 1 minute. Add the coconut milk and bring to a rapid simmer, then reduce heat to medium low, cover and simmer for 8-10 minutes until the chicken is cooked through and the squash softens. While chicken is cooking, heat a medium skillet over medium heat. Add cauliflower rice and season with salt and pepper. Cook for 3-4 minutes, stirring occasionally. Turn heat down to low to simmer. 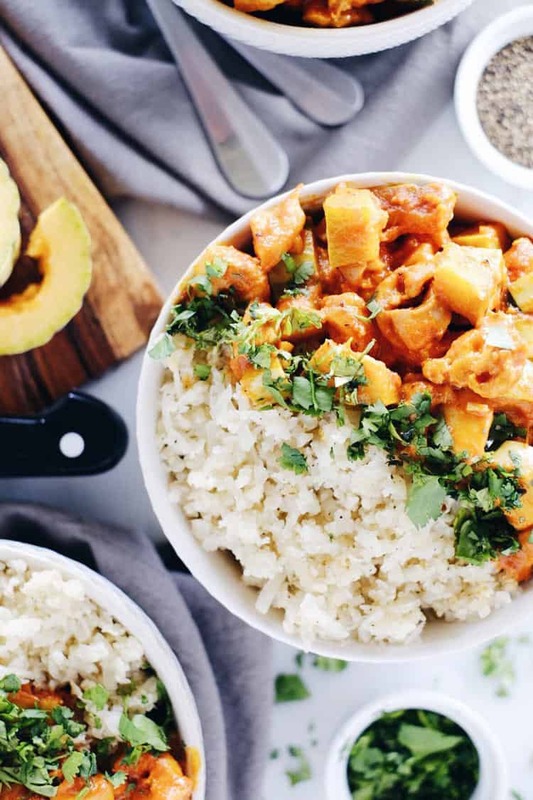 Serve the curry chicken over cauliflower rice.